Apparently we were on a very short roll last week on Who Do You Think You Are? when Rita Wilson was so honest about the fact that she wasn't doing any of the research. With Edie Falco we're back to pretending the celebrity is doing the research and it isn't all done ahead of time. And of course the buildings are all empty of other patrons and the celebrity meets with the head of the archive. Maybe the only reason there was no pretense with Wilson was because she was in foreign countries where she obviously didn't speak the languages and couldn't possibly be reading the original documents. That said, the introduction talked about Falco's career in television, film, and stage and that she was the first woman to win Emmys for outstanding actress in both comedy and drama. She was born in Brooklyn, grew up on Long Island (let's not forget that Brooklyn is actually on Long Island, so she wasn't going very far), and now lives in Manhattan. She talked about how her parents "split" (I don't know if that means divorced or separated) but family is very important to her. She has adopted two children of her own and wasn't sure what to tell them about the family research she was going to be involved in. 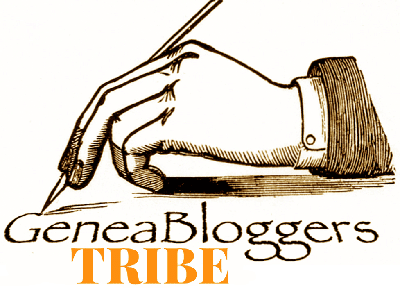 Is family merely bloodlines, or something more than that? She found a definition of family that said it was a group of people living together with someone as the head of the household, and that fits her life. Falco's father is Italian, and she knows his side of the extended family fairly well due to visits and get-togethers. Her mother's parents had died long ago and there was "less cohesion", so she wanted to know more about that side. To get more information, she went to visit her mother, Judy Anderson, on Long Island. Anderson had a copy of a family tree that "cousin Linda" had made. It had a lot of details written on it, and I wish we had had the chance to see more of it (and it isn't one of the documents available on the Web site). The tree showed Judy's mother as Ruth Megrath and her father as George Megrath from Wales. Anderson also had a photo of her grandfather sitting outdoors in a chair. The story was that Megrath was his mother's maiden name, his father's last name was Brown, and his mother had left his father in Wales and brought him to the United States. This, of course, begged the question of why? Falco had never heard of Wales in connection with her family but assumed he had to have been born there because of the story. Without knowing more about Wales, however, she decided to start her research in New York, because she knew he had been there. Falco immediately contradicted this last statement as she was heading to the New York Public Library by saying, "Mom thinks George was living in New York." (Thinks, knows, same thing, right?) With that amount of reliability, it's a good thing she wasn't going far out of her way. At the library she met Maira Liriano, who works in the library's Milstein Division. (I recognized her as having been one of the researchers on the Gwyneth Paltrow episode.) They found George Megrath in the 1920 census in New York City, but the census said that he was born in Wisconsin, his mother was born in New York, and his father was born in England. It seemed to be the right person, however, because the rest of the family matched exactly. Falco asked Liriano for confirmation that England was a separate country from Wales (duh!) and commented that her mother's family tree was wrong. She then said, "Let's see what else I can find on Ancestry.com." Heaven forfend any other site could be used! Falco found someone's personal family tree on Ancestry that said Megrath had died in 1947 in Massachusetts at the age of 70. The tree had a link to a scan of an obituary that said he was born in Milwaukee, Wisconsin. From that Falco concluded that Megrath had not been born in Wales after all but in Wisconsin. So first she took the word of her cousin that Megrath was born in Wales, and then because an obituary said he was born in Wisconsin she decided her cousin was wrong and information from the second person, whom she didn't know from Adam, must be right. This is a way to show analysis of information? What happens if a third person says he was born somewhere else? But take his word she did, and off she went to Wisconsin with the comment, "I hope Milwaukee will give me more clues." In Milwaukee she went to All Saints Episcopal Cathedral, and said she was doing so because it holds a lot of historic baptismal records. Normally a church will only hold baptismal records for its own denomination, so we had to assume that Megrath must have been baptised as an Episcopalian, but the way it was phrased seemed to imply that All Saints held baptismal records for the city. Very misleading scripting here. She met with Christie Manussier, the office manager for the cathedral, and told her she was looking for baptismal information for her grandfather. Manussier brought out books for a range of years and said that the church had been pretty diligent about including most information about babies. Unsurprisingly, Falco found George MeGrath Brown, born March 21, 1876 in Milwaukee, whose parents were Charles Childs Brown and Mary MeGrath Brown. Charles Brown was present for the baptism, as he was listed as a sponsor. So Megrath's father was part of his life after all, at least at the beginning, which differed from the family story Falco had been told. To find more information about Charles Childs Brown, Falco next visited the Milwaukee County Historical Society (not Center, as was listed on screen) and spoke with archivist Amanda Koehler (more accurately the Assistant Curator of Research Collections). She told Koehler an incredibly vague story of what she was trying to find: My ancestor was here in 1876 to attend the baptism of his son and I'm trying to find more information about him. Magically, of course, information was there to be found. Koehler told Falco to look in city directories to see if he was listed, and she (Koehler) would look in censuses. Falco found a Charles C. Brown in the 1870 directory who was an apprentice with the Milwaukee News, but she conceded it could be a common name. Koehler found no Charles Browns in Wisconsin after 1870 (What about before 1870? We didn't even know how old he was or when he and Mary MeGrath were married.) but did find a 32-year-old C. C. Brown in the 1885 Minnesota state census in the town of Little Falls. Now, Little Falls is more than 400 miles from Milwaukee, so there was no reason to assume it was the same person, especially only with initials, but he was born in England, which matched the information from the 1920 census. At least for this there was not an automatic leap; Falco said it was compelling (maybe for varying definitions of the word compelling) but that they didn't know for sure if it was him. Then Koehler produced a book she called Historical Sketches of Royalton, Minnesota (actually Historical Sketches of Royalton and Vicinity), which had an entry for Charles C. Brown. It said he had been a printer and writer and started Royalton's first newspaper in 1885. He then moved to Duluth, where he was the night editor, and died there. There was no reference to any family. Royalton is only about 10 miles from Little Falls, so it was not unreasonable to think this was the same man from the 1885 census. The fact that he worked for newspapers made a connection to the Charles C. Brown in the 1870 Milwaukee directory, but it was still not a strong case. That's what we were going with, however. As the program cut to commercials the teaser for the next segment showed a newspaper article with the title, "What Happened -- A Sad Accident." When the program returned Falco was meeting with Dr. James Mueller, an associate professor of journalism at the University of North Texas. They appeared to still be at the Milwaukee County Historical Society. He said he had been researching Charles Brown and had found an article from the Duluth Daily News of April 10, 1892 (the "Sad Accident"). It said that Brown's son (not named) had died in Albany, New York, from being struck by a "surface car." If this was supposed to be George Megrath Brown, we knew he hadn't died in 1892, so Falco was confused. There was some discussion of how someone might have jumped the gun with the article and maybe George had been hit but not killed, but the question was not resolved. 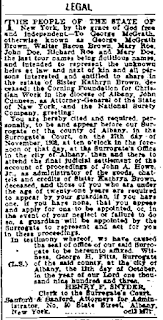 Mueller then showed an article from the Albany Evening Journal from 1905 which said that an heir to the estate of Sister Katherine Brown, who had died January 25, 1902, had come forward. Katherine apparently was the sister of Charles Brown, and George had claimed the estate as Katherine's nephew. We then learned that Mary Megrath Brown had divorced Charles in 1878 in Minnesota. Charles had married a second time in Chicago and had two children; that marriage ended in divorce. (Maybe it was a son from that marriage who died in 1892, but that was not brought up on the show. Also not addressed was if either of these children put in a claim for Katherine's estate.) His third marriage also ended in divorce. He had a fourth wife, to whom he was apparently still married when he died, because nothing was said to the contrary. Mueller said divorce was common for newspapermen of that time, as they worked long hours and drank a lot. Mueller is apparently knowledgeable about the history of journalism, but this struck me as a very broad generalization. Falco said she was left with a sad image of George. I'd say that was an understatement. 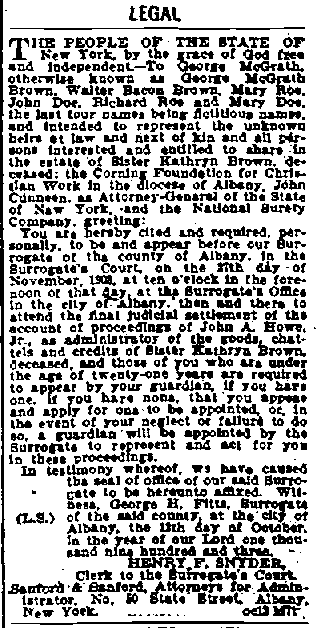 Falco decided to look for Sister Katherine Brown in the 1900 census, which actually was a logical thing to do if she wanted to find more information about the family. She somehow found her (with a name that common, heaven knows how she picked her out, though); the census said she was born at sea and that her mother was born in England. (What about her father? And one of the many interesting things not addressed in the episode, why was she Sister Katherine? Was she in a religious order?) So Falco said, "I think I have to go to England to find out more." Yeah, right! How about more research to figure out where in England you should be looking? But that would be too logical, so off she went. We next saw her in London, where she said she needed to find a family historian. All she had to go on was a birthplace at sea. Somehow she connected with Jo Foster, credited as a family history researcher, at Fulham Town Hall. Do you feel there's a magic wand being waved over all of this? Where's the fairy godmother? Is this a Disney movie? Foster had a book with birth registrations and said, "See if you can find your" great-great-grandfather. Falco found Charles' birth record for August 16, 1853. His mother was listed as Catherine Brown formerly Kindley, and next they looked for more information about her. (Why not look for information about the father? This was the second time he had been bypassed. Obviously, the show's researchers must not have found anything about him, or else he was boring. Therefore he shouldn't be mentioned.) Foster had Falco look for Catherine Kindley in the 1841 English census (on Ancestry, of course), but she didn't find her. Foster disingenuously suggested looking under the name Kate (they're getting less and less subtle about the way they lead the celebrities), and amazingly enough Kate Kindley, age 10, born in Cornwall, was found in Penzance. She was living with 69-year-old Jane Childs, possibly her grandmother?, and 28-year-old Elizabeth Childs, but no other Kindleys. To find more about Kate, she went to Penzance. Before we saw Penzance, there was an introspective segment where Falco talked about how these people actually existed and that it was unnerving to find records of family members. (I guess she's never considered what kind of paper trail she has created during her own lifetime.) She wondered why Kate wasn't with her parents and if she really had been born at sea. In Penzance archivist Chloe Phillips of the Morrab Library was on hand. Falco told her she was trying to track down information on Kate Kindley, who was 10 years old in 1841. (See how far you get with a request like that at a library.) Phillips brought out a book cushion and conservator's gloves for Falco to wear, then set out a book and said to look for Catherine in the book. If you're going to go to the trouble of using conservator's gloves (which, as I've commented before, are now considered by many to be a deprecated practice for handling paper, because you lose your tactile sensation and can damage the paper more than with your finger oils), why have someone page through a book instead of just going directly to the relevant page? But Falco eventually found Catherine, who was baptized in October 1831, the daughter of Ralph and Dorothy Kindley. Ralph was a master mariner from Penzance. We then had a short narrative on British maritiime history and how a mariner would have spent most of his life at sea. That could explain why Kate's father was not enumerated in the census, but not her mother, so Falco wanted to find more information about the parents and why Kate was with her grandmother in 1841 (assuming that was her grandmother, of course; we had seen no research to confirm that). Phillips suggested she look in the newspaper, and the West Briton and Cornwall Advertiser of March 8, 1833 had a note that Dorothy, the daughter of Childs and wife of Captain Kindley, had died at age 28. Now we knew why Dorothy wasn't in the 1841 census, and this did seem to indicate Jane Childs was likely Kate's grandmother, but what happened to Captain Kindley? The final segment took Falco to Charlestown, Cornwall to meet Dr. Sam Willis, a maritime historian and author. This location was purely window dressing, as none of the research revealed had anything to do with Charlestown. Willis took Falco out to the Earl of Pembroke, which he said was similar to the types of ships her fourth great-grandfather Ralph Kindley would have sailed. Falco asked if it were possible that Catherine was born at sea, and Willis said Dorothy easily could have been used to being on a ship. He had found that in 1831 Kindley was the captain of the Lord Cochrane, which had put into New Orleans. While there wasn't direct documentation of Catherine's birth, the pieces did fit. (In the middle of this we suddenly got a beautiful piece of unexpected eye candy in the form of a shot with a rainbow in the background.) Falco wondered where Kindley had been during the 1841 census. Willis had also found New York Public Administrator papers from October 1840 regarding the estate of Ralph S. Kindley, mariner, who had died about July 20. He had been on a voyage from Africa to New York on the schooner Africanes. He died of fever and was buried at sea. Falco said how very disheartening it was that "little Kate" had lost both of her parents before she was 10. So much of family is about nurturing, but George's mother had divorced and Kate had been left without parents. She talked about the "emotional clouds you were surrounded in as you grew up" and how it was really about the people who loved and cared for you. It struck me as a little overdramatic; why focus only on the negative? What about the other generations that did not have such events? So even though from a research perspective this episode had a lot of flaws, what Falco had learned did appear to have resonated with her. Again we did not see a reprise with the family member we had started with. Maybe Falco's mother was unsettled with the information that had been found. I squeaked through with my prediction on this one. Most of the research focused on general background in the U.S., not any major historical events. They did go to England and Cornwall, so we had an ancestral country, but it wasn't Italy or Sweden, which is what I had been anticipating. And I was right with Rita Wilson, so I'm still batting a thousand, but barely. Not only that, but WDYTYA has reruns for this week and next, so I'm actually caught up! Having only recently viewed this episode, I'd like to comment on a couple of points in your blog. George Megrath Brown was mentioned by name in the 1892 newspaper article as the son of Charles Childs Brown killed in a car accident (Though the report admits he'd only received very sketchy details, which we know now cannot have been true). Also the 'Wisconsin link' did have a correlation with 'Aunt Linda's' account. Her tree stated George Megrath Brown was brought to U.S.A from Wales by his mother where they lived in an Episcopalian Convent in Wisconsin and he broke his leg trying to escape. Clearly this is a confusion of generations with George's father Charles Childs Brown who did live there as a child with his mother Sister Kate 'Kathryn' Kindley Brown. Though Charles Childs Brown was born in London, England, his mother Kate had met and married his father, Londoner William Biffield Brown in New South Wales, Australia, which maybe where the 'Wales' confusion crept in. They then returned to England, moving again to Canada and finally Wisconsin. All these last details come from the internet and were entirely omitted from the show, which I agree is a puzzling decision and made for confusing viewing. Thanks very much for your comments. There definitely appeared to be confusion in this episode, along with lots of leaps of logic and accepting information as presented. That's interesting about the marriage in New South Wales (I know people even today who confuse that with Wales). I would would guess that the show's researchers found that information also, but it certainly would have helped if they had managed to include it in the episode. Have just found another child of William and Catherine Brown, Kate Shelson Brown, (Ralph Shelson Kindley- father of Catherine? ), which might help prove link she was born 1866, married 27 march 1888 Schomberg Ontario. Thanks for sharing the extra research you did. As I have mentioned before, we don't get to see most of the actual research done on WDYTYA, so I always want to believe that they've done professional-quality work behind the scenes. Since I don't know what documents they used to support their conclusions, or what documents you have used to support yours, it's impossible for me to say who might be right. I will note, however, that the episode discussed administration paperwork for the estate of mariner Ralph Kindley who died in 1840, which brings into question the identity of the Ralph Kindley you found in 1841. Apparently Dorothy and Kate arrived in Australia in 1848 and it is suggested that the marriage notices were put in the local paper in Penzance as a distraction. It is odd that one sister allegedly married at Registrars office in Redruth, 24th June, (working outdate from the date of paper, and day mentioned), and Kate marrying 22nd June 1848. Quite a fascinating exercise to try and work it all out!, I noticed on the program that they must have taken Edie to the street where her ancestors lived. (I google mapped it and checked. )As usual with these things they leave lots of useful info out!! Perhaps the captain of the ship going to Australia was a family friend who took pity on the two orphaned sisters? Jane Kindley nee Berryman on 1841 with various children and stepdaughter Jane, was 2nd wife, married 1834.Ralph not on the census at all.Sorry not to have been more specific! Also found Ralph on the familysearch page born Newcastle (U>K>). One of the children from second marriage named Christopher Sheldon, and the Ralph I found in Newcastle had Sheldon as a middle name. Wow, you are having fun with this, aren't you? Maybe you can send the additional information to Edie Falco through her agent.